It was a Sunday morning and the Met Office forecast had told us the wind speed and gusts could exceed 20mph. 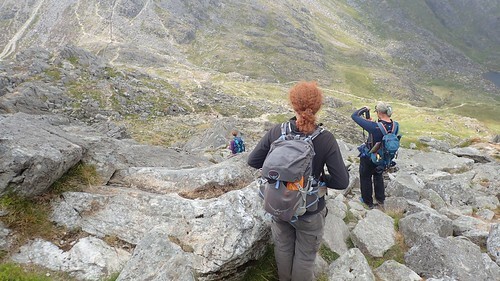 Our other option had been to do the Snowdon Horseshoe on this day. Aside from the likely crowds and chaos in the car parks, it would’ve carried a greater risk in such conditions. 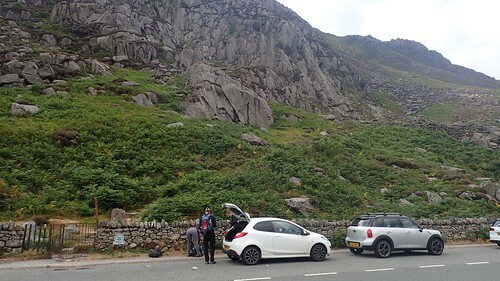 I think we arrived about 9am, having driven for almost an hour from Llandrillo and followed the A5 all the way. 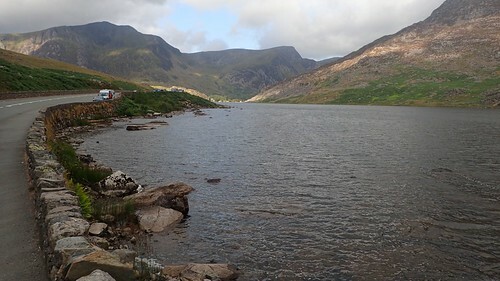 We parked along the south of Llyn Ogwen, right beside the very footpath that we’d begin to follow. I was surprised by the great wealth of parking space available. 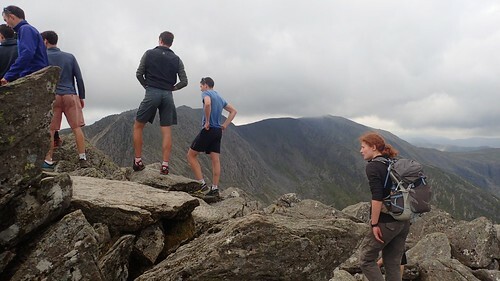 I’d imagined Tryfan was almost as popular with weekend walkers as Snowdon. 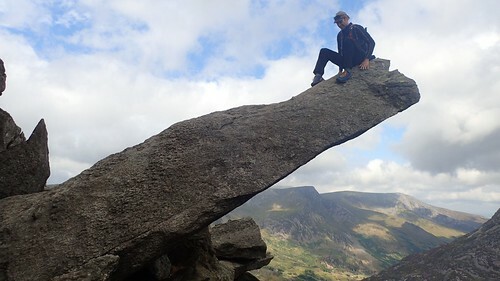 It’s well know that you have to use your hands when climbing to the summit of Tryfan. 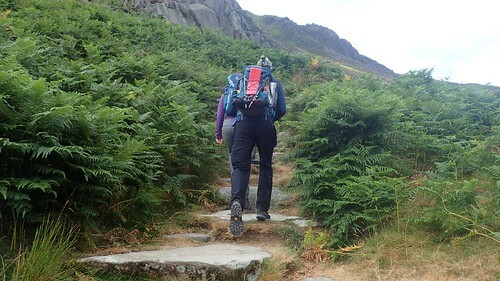 I don’t know of any other mountains in Wales that cannot be accessed just by using your feet. Those initial, crafted steps may be misleading, for anyone who’s unaware. 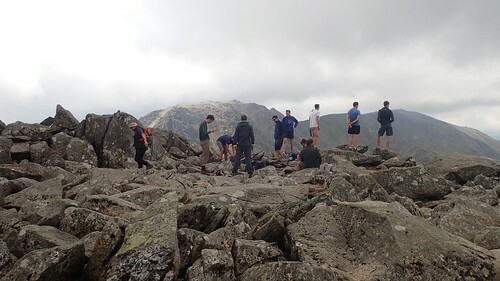 It’s really not long before the scrambling begins. 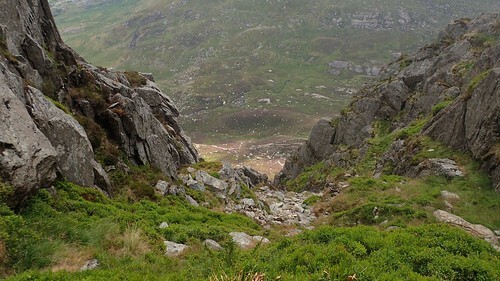 Unless your following the Heather Terrace route that skirts around the lower contours of the eastern elevation. 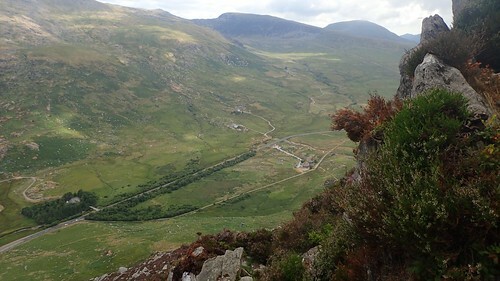 Soon leaving the lake behind, as we climbed up and away from the Ogwen Valley. Looking at the route from an Ordnance Survey map, it does look straightforward. 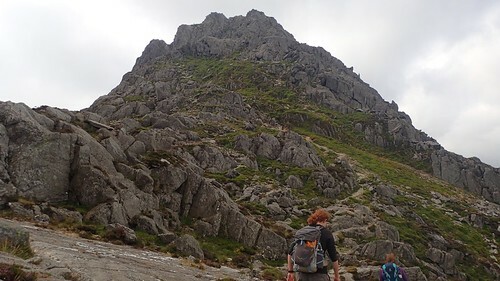 Follow the green right of way for a few hundred metres, heading south-east, before turning south to climbing straight up and along the black dashed line and on to the summit. On the ground, it’s a very different story. 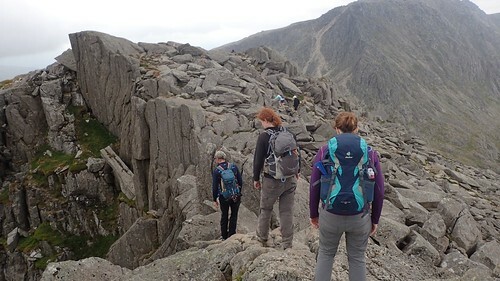 The ‘main’ route to the top is not waymarked at any point and, unless you’ve done it before or you’re following a guide, you can spend a lot of time searching an accessing the possible routes up before continuing forward. Every now and then, we’d use our GPS devices to check on our precise location, to lessen the risk of drifting too far to the east or west. Following other people wasn’t always an option and it’s rarely the best course of action in any situation, as different people will have varying abilities between them. Occasionally, the presence of a cairn may help. Far beneath us and away to the east was a camp site. 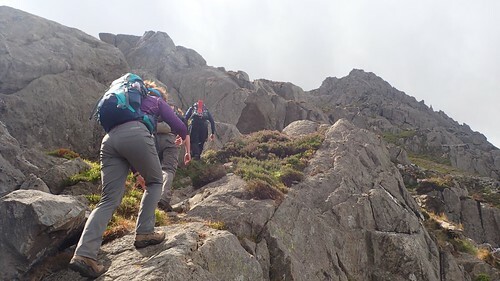 Ideal for exploring the Glyderau and mountains in the Carnedd range. But I imagine it gets busy and it must be hard to switch off from the passing traffic along the A5. 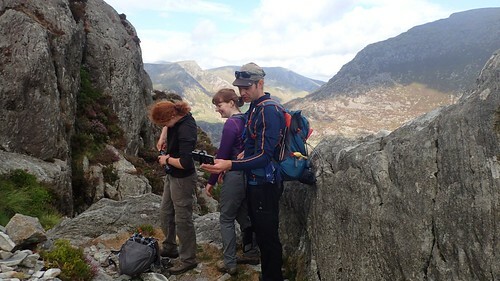 As we weren’t regular or experienced scramblers – even with two climbers in the group – our water breaks and pauses were quite frequent; allowing time for route planning, the necessary checks and… Group selfies! 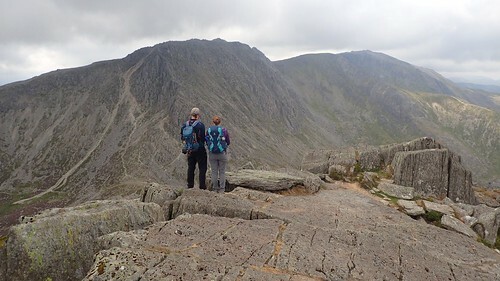 It wasn’t long after this that we could just make out the summit. While the day was set to be grey and overcast, the views so far had been very good and clear. 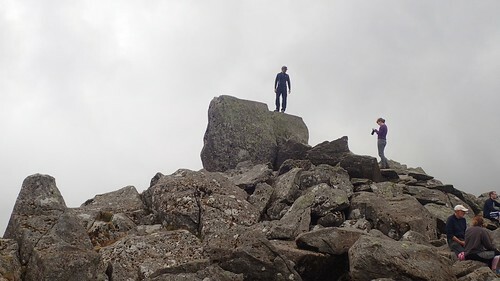 We found the Cannon Stone; an infamous sight and another indication that we were following the correct course. Dave was wearing climbing shoes with good traction. 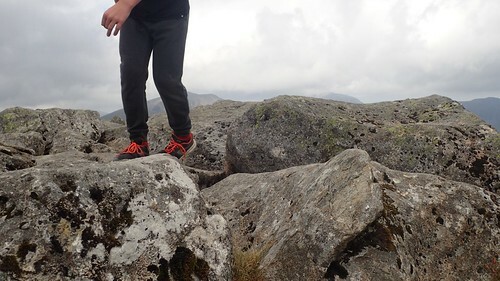 But even if was not comfortable with the idea of standing up, as the surface was quite ‘polished’ and slick (this is something else you can look out for to find ways that other people have climbed). Thanks also to Dave for this photo. I made a similar choice in not-standing-up and decided to reverse-scramble my way back down the slope on all fours. This Cannon Stone can be seen quite clearly from the road far below. This was my view, peering over the diving board-like edge. As we finished taking our own photos, a group of climbers (they sounded Australian, to me) emerged, awaiting their own opportunities to climb, straddle and pose. We walked on. 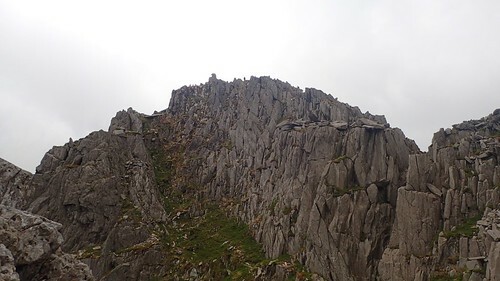 A solo walker from Leicester – who told me he’s done the Snowdon Horseshoe two weeks earlier and only started walking last year – caught up with us and I remember he carried on to follow a group of climbers up a route that deviated from our own. From this side, it didn’t look to bad. 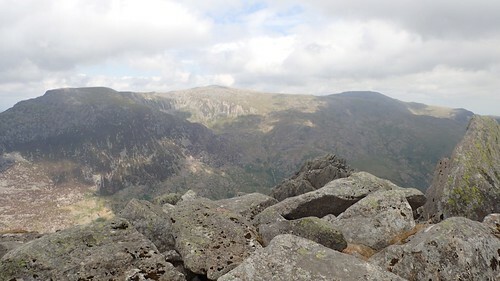 But, we’d later see and hear of how he regretted that decision and would require the help of able and full-kitted climbers to get down safely from the other side. 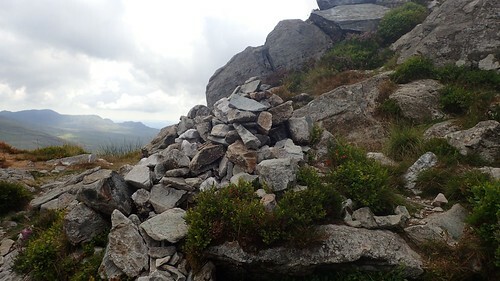 Nearing the summit, the rocks grew taller. Intimidating. But, at the same time, this limited are options to fewer potential routes. I could not imagine attempting this sort of adventure in poor conditions. There’s no easy point along the way from which you could safely escape or turn back. Again, we could see the summit. But for the lack of a footbridge spanning the gap, we’d have to walk down, around and then up to reach it. 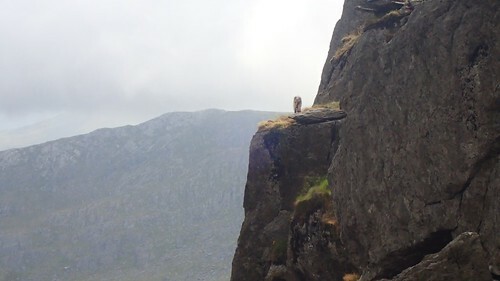 A lone mountain goat – the only one we’d seen – was perched on what appeared to be a precarious ledge, beyond our reach. Minutes later, we’d hear it making a lot of noise but out of sight. We hoped it hadn’t fallen, like the occasional sheep story you hear of. 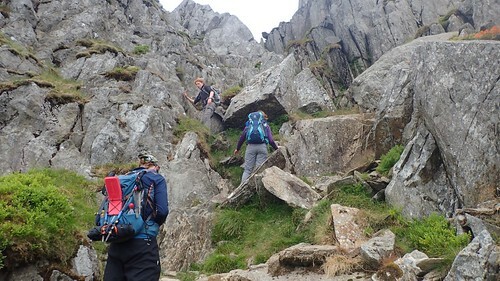 These guys were attempting a much more challenging route to the top. Although I can’t see clearly in this photo, I’d presume they had ropes. Maybe even helmets. 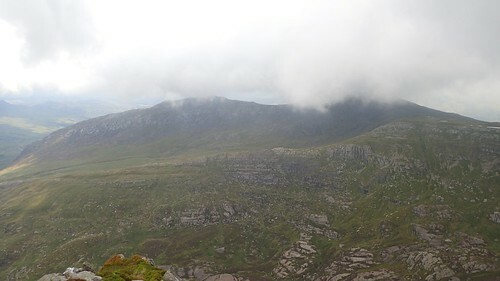 Looking north across the Ogwen Valley, you have the Carnedd mountains – Dafydd and Llewelyn – along with Pen Yr Ole Wen. 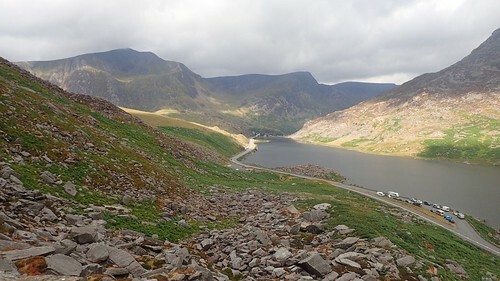 All of which are known to be less busy than Snowdon throughout the year. 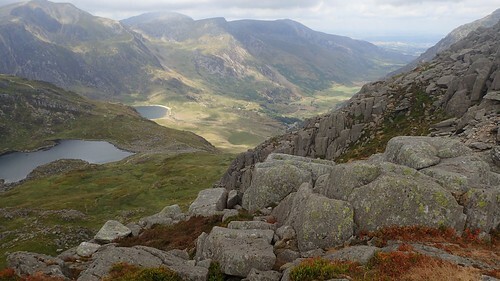 I hope to be able to explore the Carneddau on another visit to this land. We arrived at the summit, not far behind the climbers – identifiable by their shorts and shoes combination, with minimal backpacks, if any. 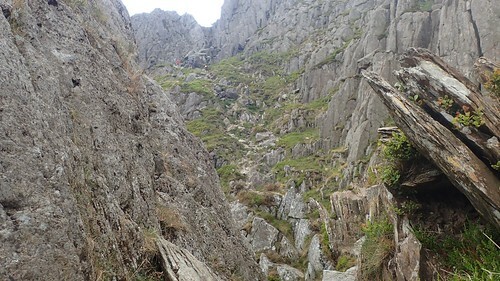 That’s the other side of the climber’s route I mention earlier, where the guy from Leicester had to be helped, as he would soon tell us. We waited for our turn to climb Adam and Eve; a significant pair of summit stones where visitors are known to jump from one to the other! In truth, I was waiting for the accomplished crowd to disperse and move on, before drawing attention to myself and my own effort. 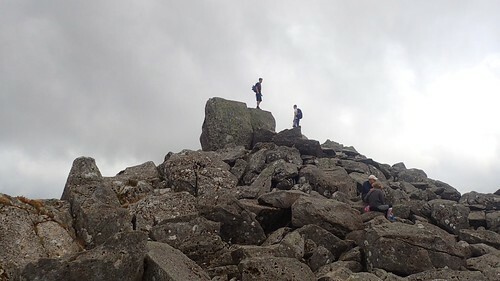 In all fairness, they didn’t hang around for long and, apart from three or four other people who seemed inclined to sit and enjoy the views, we had the summit of Tryfan to ourselves. 917m above sea level but with no trig point in sight. After Dave, I went on to complete The Jump myself, moving from left to right (I don’t know which is Adam and which is Eve but one is much narrower and more slanted than the other). My own effort has been captured in video form and will appear on YouTube when I get around to it. I set my camera up to do a timelapse while we sat on rocks to the north, only for a few people to emerge and step across my camera’s view. This was the first timelapse I’d ever recorded with my Olympus TG-4 camera. It came out well, although I’d like to adjust the settings so it might record for a bit longer. I normally use my cheap action camera but you cannot turn the beeping off and I was conscious of the fact we were sharing this space. Although we were exposed, I don’t remember it being very windy. 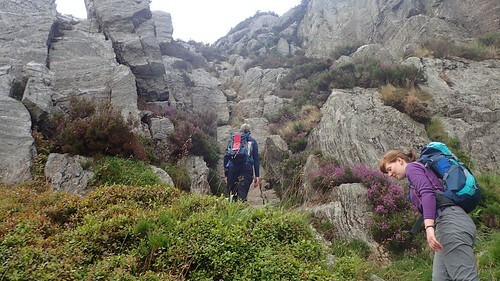 After lunch, we continued south, descending towards Far South Peak and then on to our next proper challenge of the day. 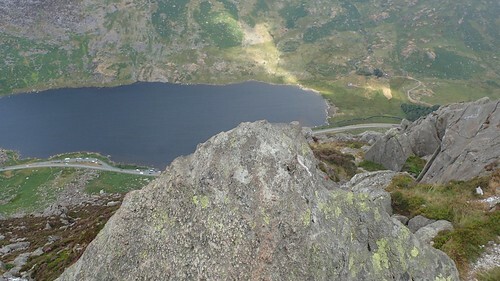 Down to our right now was Llyn Bochlwyd. 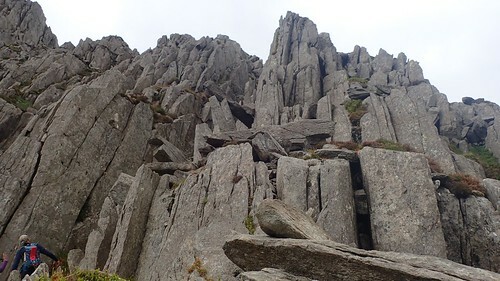 Our next challenge would involve a scramble up on to Glyder Fach. 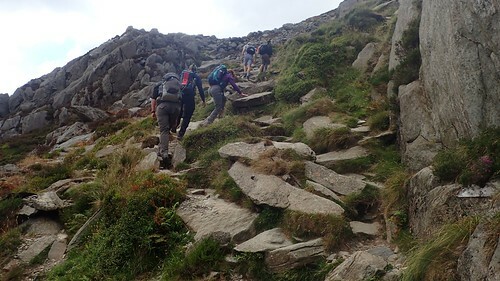 At all costs, we were determined to avoid the obvious scree path, which also happens to be the only route marked on an OS map. 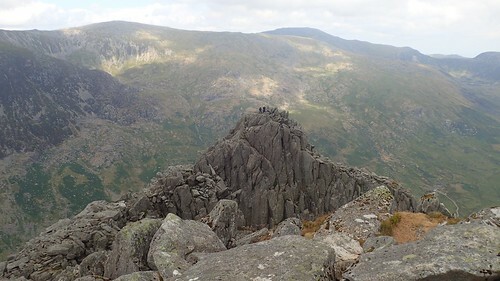 Looking back to Tryfan, with others now attempting to make The Jump. 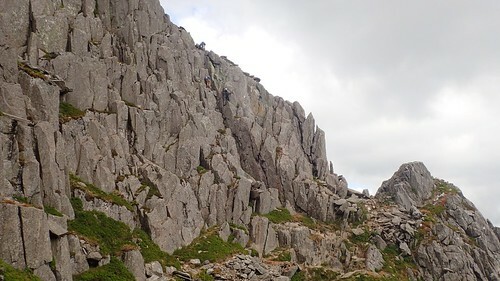 It is said that an easier route up Tryfan – maybe even the easiest – is to follow the Heather Terrace path around the east side and then to approach the summit from the south. Hands are very much required and it was by no means an easy task of going down, as we discovered. 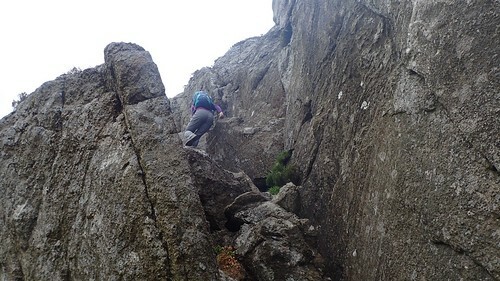 I often reverted to the technique of ‘down-climbing’, where others may be include to almost bum-slide. In distance, I think we’d barely covered a mile, if even that much and yet, it had taken three or fours hours to get this far! 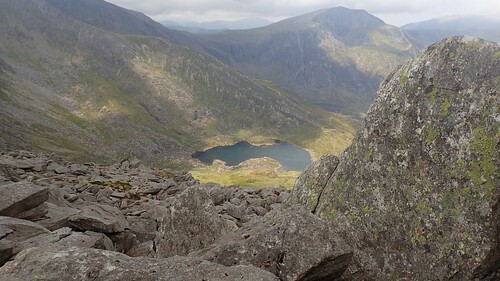 I’d like to do Tryfan again one day, even following the same route. Ahead of us was another challenge, that I’m saving for my next post. 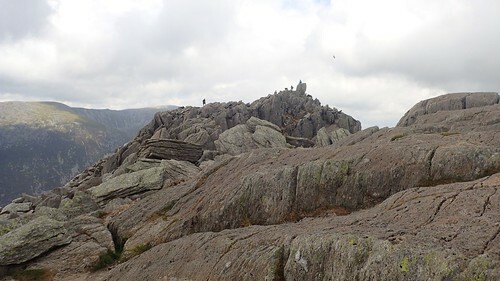 Recommended viewing: Summit or Nothing’s attempt to climb Tryfan in poor visibility.